Accounting Program is a popular MBA program in US. The US News Education Department has calculated the MBA accounting program ranking in 2013. 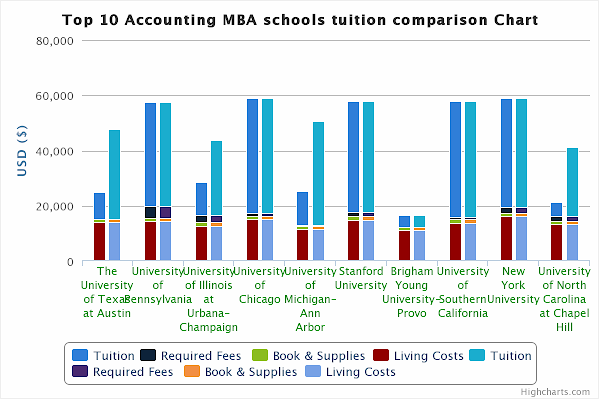 We compare tuition costs of top 10 accounting graduate schools as table and chart below. You can see detail tuition and costs information of your desired schools by following its name. Next table and chart compare tuition,fees, and living costs between best 10 accounting MBA colleges. You can see more comparison chart including in-state, out-of-state, on-campus and off-campus living costs, scholarships, and financial aids at top 10 accounting colleges comparison page.